Miami's 2019 rotation will begin with Jose Urena (3.98 ERA/1.18 WHIP in 2018), Caleb Smith (4.19 ERA/1.24 WHIP) and Wei-Yin Chen (4.79 ERA/1.33 WHIP) followed by a combination of Dan Straily, Trevor Richards, Sandy Alcantara, Pablo Lopez and a handful of other arms that will come and go throughout the year. The one to watch from above is Alcantara, 23, who struggled with his command during his big-league debut last season when he had a 3.44 ERA in six starts. He's reminiscent of Rafael Montero, which is to say that he can be very effective when painting the plate. Otherwise, he'll get hit and eventually be considered a reliever. Marlins fans will want to see 20-year-old Sixto Sanchez, who is consistently ranked among the best right-handed pitching prospects in baseball. Most scouts and prospect experts say he has the potential to be an ace when healthy. But, because he's so young and been so fragile, Miami will likely goose him along, meaning he probably won't make a big impact on the NL East this season. The rest of Miami's pitching prospects project to be mid- to back-end starters and are all at least one or two years away from making their debuts. The Braves were hoping to feature a starting rotation of Foltynewicz (2.85 ERA/1.08 WHIP in 2018), Julio Teheran (3.94 ERA/1.17 WHIP), Kevin Gausman (3.92 ERA/1.30 WHIP), Sean Newcomb (3.90 ERA/1.32 WHIP) and Touki Toussaint (4.03 ERA/1.34 WHIP). Sadly for Atlanta, Foltynewicz will miss Opening Day with a sore elbow, which had been bothering him since the middle of February. The team has yet to say when he'll begin a throwing program, which -- as we know from experience -- means he will probably be out longer than expected, despite reports he could return by mid-April. In his place, the Braves have said either Newcomb or Teheran will start Opening Day. Losing Foltynewicz for a significant amount of time, especially for a young team at the start of the season, would be a big hit to their hopes and dreams for 2019. The rest of the rotation is good and has potential, but also has downside and significant flaws, which is why to save their season they probably will need to call on their crop of top kids biding time in the minor leagues. Their top pitching prospect, 21-year-old Mike Soroka, who pitched well during his first five starts for the Braves late last season, would have been a lock for the rotation. He has an imposing presence and a great feel for the strike zone. However, he's had a rocky spring due to soreness in his surgically-repaired right shoulder. The Braves have said they intend to slow-play his return, which is why their No. 4 pitching prospect -- 22-year-old Toussaint -- is expected to get the big-league rotation's final spot. If he can get control of his body and command his off-speed pitches, Toussaint is said to have the power and potential to be the rotation's second-best arm. If he struggles, the Braves could turn to their No. 2 pitching prospect, Kyle Wright, who appeared in relief for them late last season and has pitched well this spring. Or, if needing a lefty, they can roll the dice on Luiz Gohara, 22, who as recently as a year ago was projected to be a front-line starter. 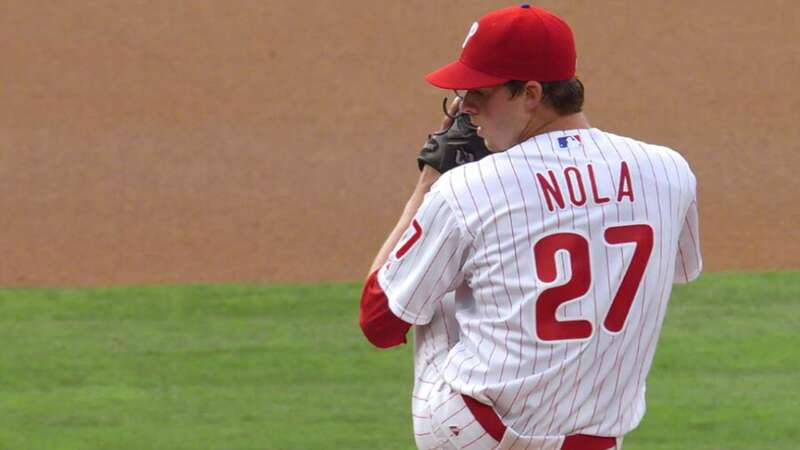 Philadelphia's starting rotation is expected to begin April with Nola (2.37 ERA/0.97 WHIP in 2018) followed by Jake Arrieta (3.96 ERA/1.28 WHIP), Pivetta (4.77 ERA/1.30 WHIP), Vince Velasquez (4.85 ERA/1.34 WHIP) and Zach Eflin (4.36 ERA/1.30 WHIP). This would be a very different list had the Phillies been able to get Corbin instead of the Nationals. They've made some amazing additions this past winter, yet are still in dire need of more production from the back of their rotation. They know it, which is why I expect them to eventually sign either Dallas Keuchel or Gio Gonzalez. That said, while Nola and Arrieta have have major name recognition and terrific track records, Arrieta has gotten worse and worse each of the past four seasons. The average among projection systems put him producing an ERA and FIP between 4.00 and 5.00 with 1-2 WAR. Similar to deGrom, it stands to reason that Nola will produce a bit less than he did in 2018. If that's the case, the duo in Philadelphia falls way short of the top of each rotation in DC and Queens. Steven Matz will be the Mets' linchpin and Joe Ross will be that guy for the Nats. In Philly, ther linchpin is the 26-year-old Pivetta, who in his second full season struck out a whopping 188 batters during 164 limited innings last season. If he builds on last year's success and steps forward in his career, he'll bump Arietta as the No. 2. If Pivetta takes a step back, the Phillies will regret not overpaying Corbin. "We have a pitching staff that -- in may respects -- is the envy of everyone in baseball," Brodie Van Wagenen said earlier this week, despite making zero additions to his starting rotation since taking over as GM of the Mets in October. The way it stands, the Mets will go to battle starting deGrom (1.70 ERA, 0.91 WHIP in 2018), Syndergaard (3.03 ERA/1.21 WHIP), Wheeler (3.31 ERA/1.12 WHIP), Matz (3.97 ERA/1.24 WHIP) and Jason Vargas (5.77 ERA/1.41 WHIP). "The one problem I have with the Mets is that, as incredible as deGrom was last season, it was the best overall season we've seen in the past decade, and what are the chances he repeats that performance," an NL executive asked me this past week. "If he does, great. But, it's historically unlikely that he'll dominate at that level again." The most recent season to be as dominant as deGrom belongs to Zack Greinke, who won the Cy Young Award in 2009 with 2.16 ERA, 8.6 WAR and a 2.33 FIP. Like deGrom was entering 2018, Greinke in 2009 had been coming off his first ever season throwing 200 innings, during which he produced roughly 4.0 WAR. In 2017, deGrom also tossed his first ever season with 200 innings and, similar to Greinke's 2008, produced roughly 4.0 WAR. Greinke entered 2009 with four full seasons under his belt, which is the same number deGrom had behind him entering 2018. The two are eerily similar. Of course, one technically has nothing to do with the other. However, given that Greinke needed seven years before rivaling his 2009, it underscores how difficult it will be for deGrom to replicate his 2018. That said, even if putting up a more realistic 5-6 WAR, combined with a full season from Syndergaard, the Mets will have one of the league's most dominant 1-2 punches. Syndergaard's stuff is unquestioned, but can he remain healthy for an entire season? He's done it just once since his rookie season -- in 2016 -- which was so far the best season of his career. Since then he's been terrific and electric, but he's made just 32 starts spanning those two seasons (seven in 2017 and 25 in 2018) due to aches and pains in his shoulder, lat and forearm. "I look at his stuff and his mechanics and the type of injuries he's had, and it's difficult not to think he's a bit of ticking time bomb," an MLB scout told me in St. Lucie during late February. "I want to believe he's a freak, and he might be, but what are the odds?" Behind Syndergaard, the Mets will lean on Wheeler, who in 2018 also put together the best season of his injury-plagued career. He had a 1.68 ERA during the final 11 starts of 2018, is due to be a free agent after the coming season, and is primed to build on his recent success in hopes of landing a long-term contract in eight months. Again, I see Matz as the linchpin on this staff. He tossed a career-high 154 innings last year and struggled a bit after the All-Star break. But -- in what is easily the most encouraging takeaway for him -- he found a second wind and finished with a 2.44 ERA during his final eight starts. What's more, by throwing his slider more than usual, he got more swings and misses on pitches in the strike zone. If Matz can bring this same approach, plus keep his looping curve ball, so long as he remains healthy and fights off aches and pains, I expect he'll improve on his 2018. If he doesn't, and if one of Syndergaard or deGrom slump or get hurt, the Mets could be in trouble on the mound. There are plenty of fans that believe Van Wagenen should have signed another starting pitcher to either compete with or replace Vargas. It has recently been reported that the Mets are still open to adding an arm, but it would need to be someone willing to take a minor-league deal. That may not have always been the case, though. Derek Holland recently told reporters that the Mets were among a few teams that showed interest in signing him. Holland, 32, signed a guaranteed one-year, $7 million deal to join the Giants. Similarly, I heard from team sources that Van Wagenen once had interest in 34-year-old veteran Josh Tomlin, who eventually signed a one-year, $1.2 million contract with the Brewers. I know, I know, how can I rank the Nationals ahead of the Mets? In my opinion, the Mets are better because I see their overall five being better than Washington's overall five. However, the numbers and opinions of experts like them slightly better, which I contend has more to do with their expected run support. That said, arm for arm, I'd take our boys in Queens. Washington is expected to begin the season throwing Scherzer (2.53 ERA/0.91 WHIP in 2018), Corbin (3.15 ERA/1.05 WHIP), Strasburg (3.74 ERA/1.20 WHIP), Anibal Sanchez (2.83 ERA/1.08 WHIP) and Joe Ross (5.06 ERA/1.31 WHIP). Scherzer and Strasburg will almost certainly produce their typical, combined 7-9 WAR. However, DC gave them a lot of help by adding Corbin and Sanchez, both of whom have experience and track records of success. With all due respect to Strasburg, it is Scherzer and Corbin that unite to be among the league's best 1-2 punch. Corbin, who inked a six-year, $140 million deal, brings to them a slick, left-handed pitcher with a nasty slider, which poses a potential problem for the left-handed heavy lineup in Queens. That said, I see Ross as the staff's wild card. Ross struggled in typical fashion returning from Tommy John surgery to make five starts last season. However, prior to popping his UCL, Ross had posted a 3.95 ERA (3.90 FIP) during his career while averaging eight strikeouts per nine innings. He'll enter this season fully healthy and, at just 25 years old, finds himself in a similar spot to where Wheeler was for the Mets one year ago. If Ross has the breakout season Washington had been hoping for prior to his surgery, much like Wheeler had in 2018, it will give Washington the best front four in the division. "If Ross struggles, so long as Wheeler and Steven Matz remain healthy, the Mets will have the better rotation," predicted one NL East scout, who felt it was currently a toss up between the two staffs. From what I've heard, while the Phillies remain interested in giving him a short-term deal, the Nationals are unlikely to sign him because he'd essentially cost them $50 million in 2019 due to the luxury tax. And, while the Braves certainly need him, they too are an unlikely destination because signing him will cost a second-round draft pick. Remember, because of Atlanta's violation in 2017, they are not allowed to sign International free agents this year, which makes losing a second-round pick all the more painful. In the end, because of the draft pick compensation associated with signing him, I expect Keuchel to eventually return to the Astros on a short-term deal instead of taking a similar offer from the Phillies. That said, if he does end up on the Phillies, Nationals or Braves, he'll obviously improve that staff and have an impact on the NL East.